Preheat oven to 350 °F. Mix the oatmeal, almonds, walnuts, coconut, flax and pumpkin seeds, maple syrup, cinnamon and salt. Bake, stirring occasionally, until all ingredients are golden brown and crispy, for approximately 25-30 minutes. Add the dried fruits and combine with the granola. You can swap out the pumpkin seeds with sunflower seeds. 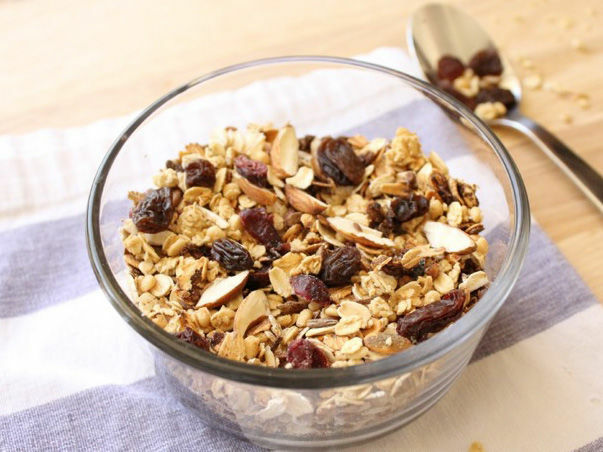 I love granola; it’s perfect in any breakfast, snack or dessert recipe. I start to crave it in the afternoon, especially when it’s homemade, and I like to pair it with fruit and yogurt. This particular homemade granola recipe is my favorite. It’s tasty, easy to put together and change up to incorporate your favorite ingredients. I hope you like it!